Step 1. Cut and sew some small end tabs onto both ends of your zip. Step 2. Take the fuseable fleece and iron it to the length of heavy weight interfacing. Step 3. Cut a strip of the tan coloured fabric 4.5cm by 40cm and sew it with 1cm overlapping to the interfacing side of the stiffened piece . 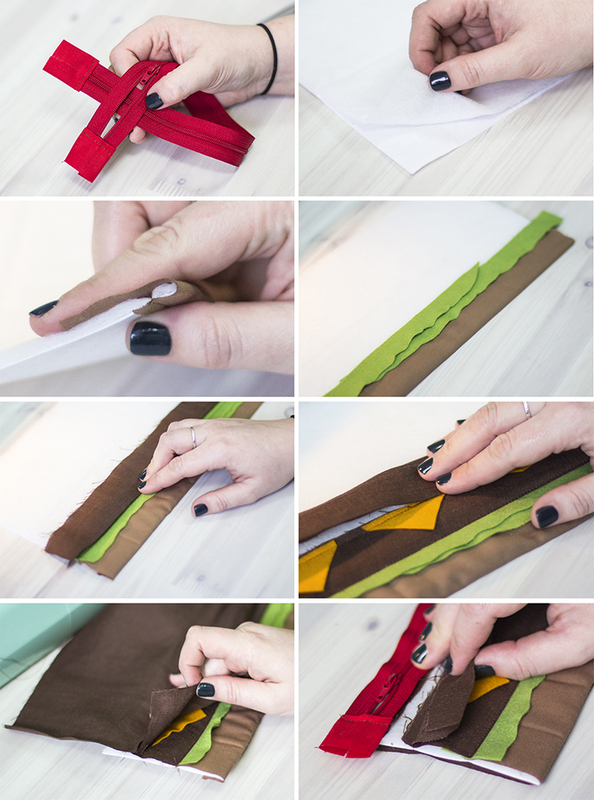 Fold it over to the fleece side and stitch it down. Step 4. Cut two strips of the green felt, one edge straight and one edge with a slight wave, this will be your lettuce. Sew it in place along the top edge. Step 5. 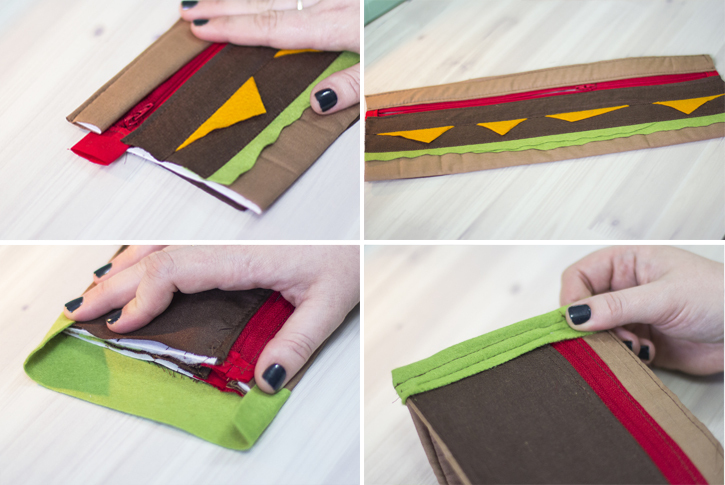 Cut a strip of the dark brown fabric 4.5cm by 40cm, fold one edge under and sew it in place over the edge of the lettuce. Step 6. Cut some small triangles of yellow felt to be the corners of a cheese square and sew them down to the top of the last layer. Then add another strip of the dark brown fabric, again folding the edge under before stitching it in place. Step 7. At this point you will want to trim a strip about 2.5cm from the top edge of the stiffening piece and put it to one side. Cut a third piece of dark brown fabric 40cm long by 12cm deep. Lift the last layer you stitched in place and sew the wide lining strip in place along the top of the stiffened piece. Step 8. Fold the rest of the lining strip to the inside and line up your zip along the top edge, fold the top edge of the last layer over and stitch it down under the bottom zip teeth. Step 9. Cut a strip of the tan fabric and wrap it around the strip of stiffening piece that you cut off previously. Sew that in place along the top edge of the zip. Step 10. 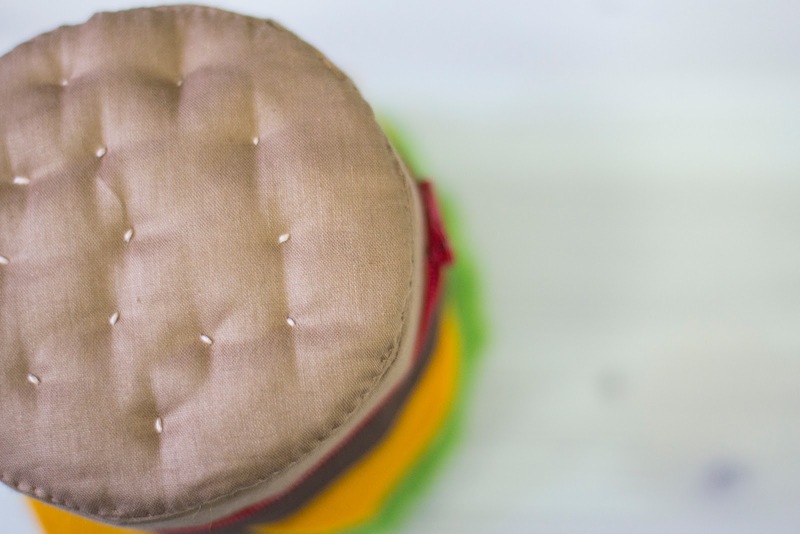 You should now have a flat strip that looks like a burger that has been under a steam roller! Step 12. Stitch over all the layers - a couple of rows will give a more secure finish. Step 13. Turn the tube right side out. Step 14. Being careful not to mark the outside, gently draw around the ends and cut out the two circles from the squares of heavy weight interfacing. Step 15. 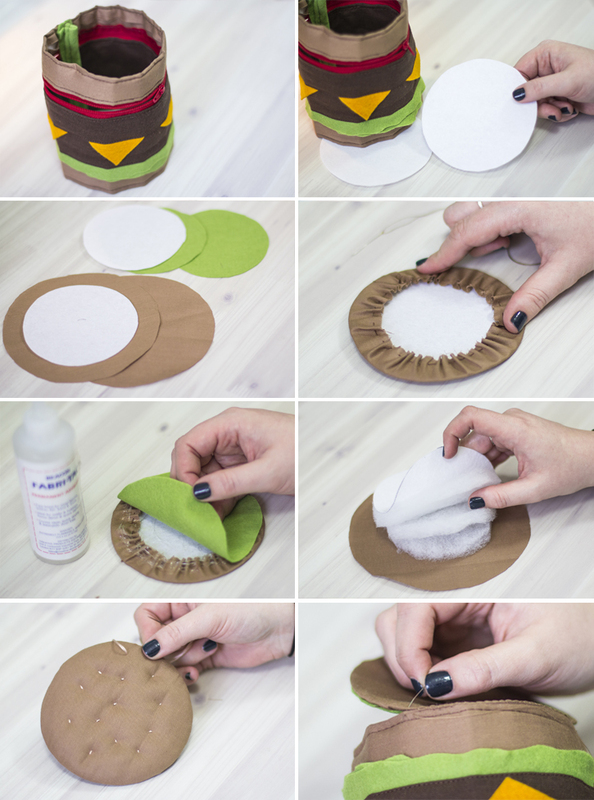 Use those circles to cut out two more the same size in the green felt and two slightly larger from the tan fabric. Step 16. Run a gathering stitch around the edge of one of the tan pieces and put one of the interfacing circles inside. Step 17. Glue one of the felt squares over the raw edges. Step 18. 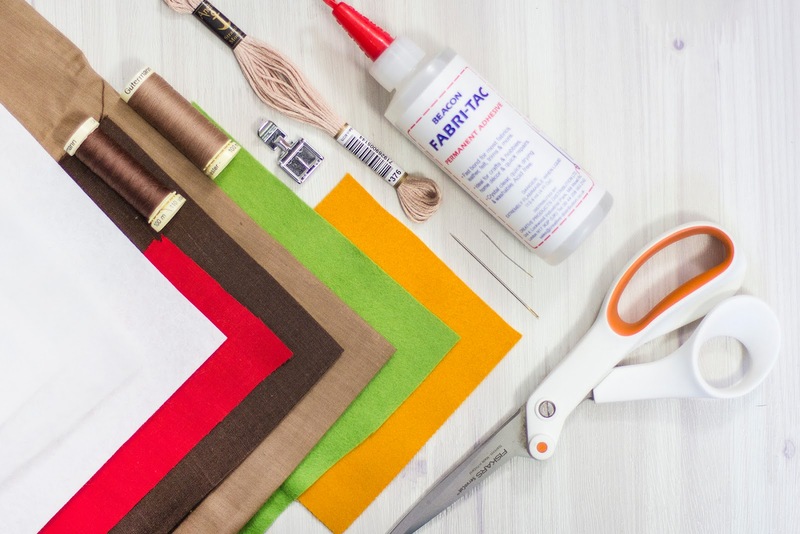 Cut yourself some circles of wadding and sandwich them inbetween the other interfacing and tan fabric pieces, again sewing around the edge and gathering it around the wadding and interfacing. Step 19. 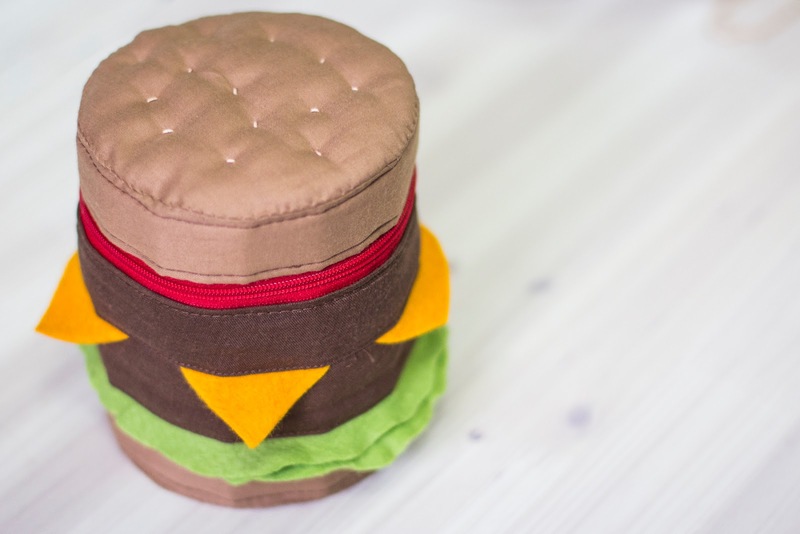 Take a small length of the embroidery thread and sew some small 'sesame seeds' on the top of the bun, then glue the second felt piece as before. Step 20. 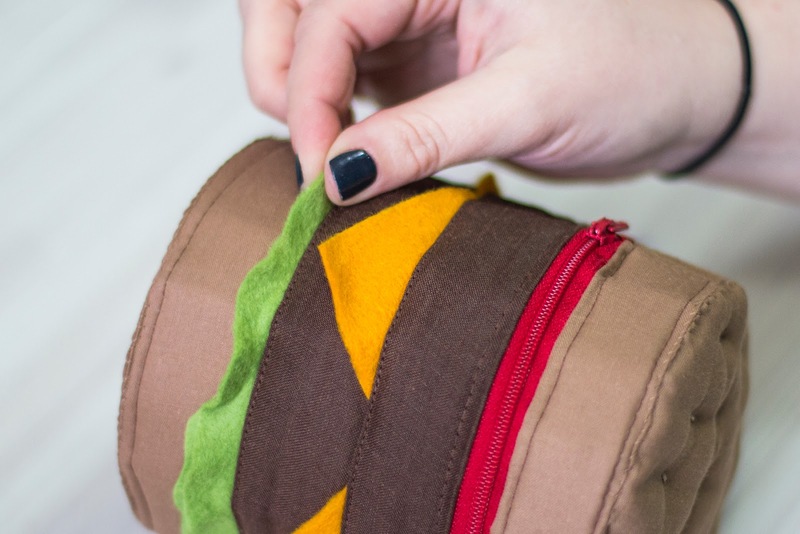 With a matching thread, hand sew the bottom and top to the 'body' of the burger. 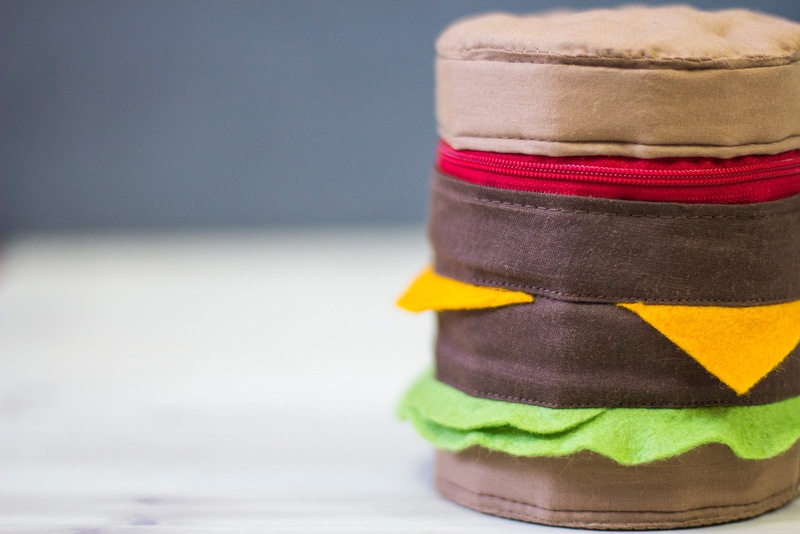 To give it a little more dimension, pull at the felt lettuce and cheese to make them stand out from the burger body. 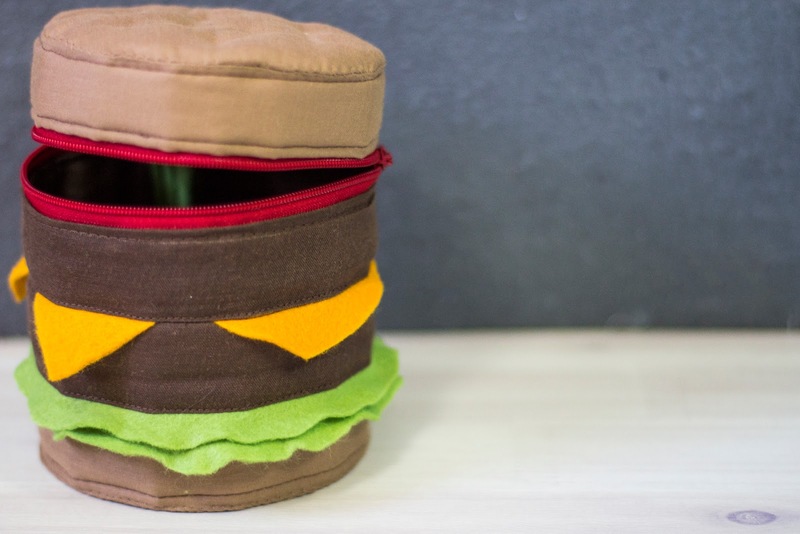 Then your burger pouch is ready to use to store some fun goodies inside. I made this one for my husband as a desk tidy for him to throw odds and ends in, but I love the idea of adding a long strap and using it a kitsch clutch bag. I have seen a few of these fun cross-body bags on the high street this year, so it could be fun! 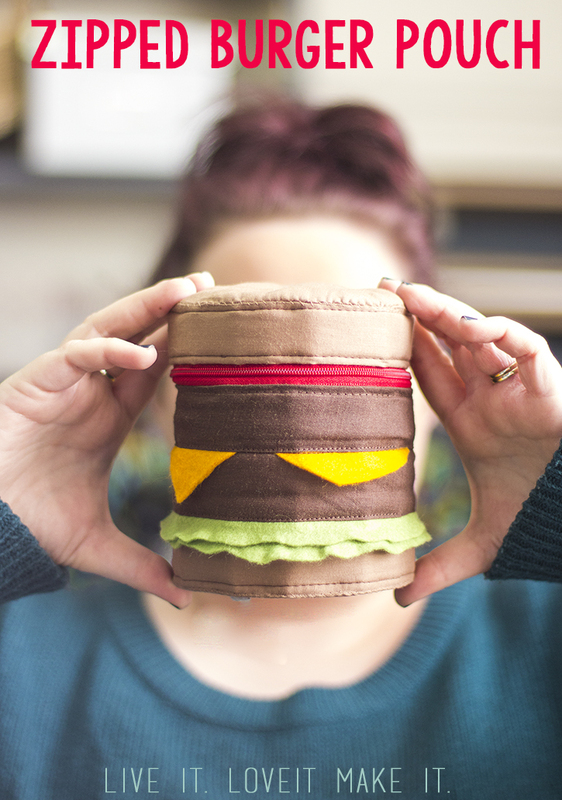 Sorry for enabling any junk food cravings, What fast food is your guilty pleasure? Are you a burger fan or more of a Chinese take away addict? Holy moly! What an awesome DIY :D good job!! Thanks Ice Pandora, what a cool name!